We stood together with our neighbors when suddenly he said: “Oh look, there’s a tiny caterpillar on your shirt !” Being the busy photographer I am instead of brushing the caterpillar off my shirt and into the next shrubbery I ran inside (caterpillar still on me) and mounted the 105 mm macro lens on my D800. 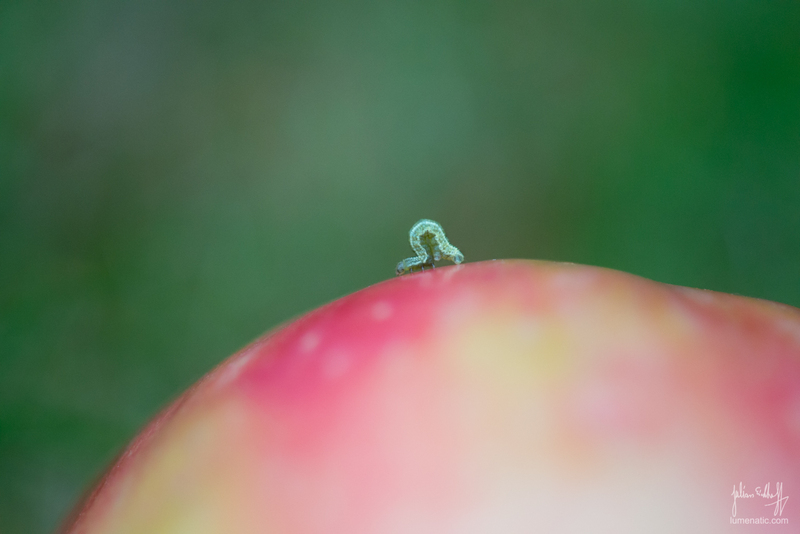 I encouraged the caterpillar to crawl onto the apple, then gently put both of them on the lawn to have a nice green background. And then I started taking pictures. One has to work quickly as the caterpillar constantly moves. Nearly after each shot I rotated the apple a bit to have the insect in a good position. The results are somewhat presentable, although not crispy sharp to the last pixel. Remember that was really a tiny caterpillar, perhaps only 6 mm in length. Anyhow, enjoyed the opportunity and now I am looking forward to what insect might crawl on me next.